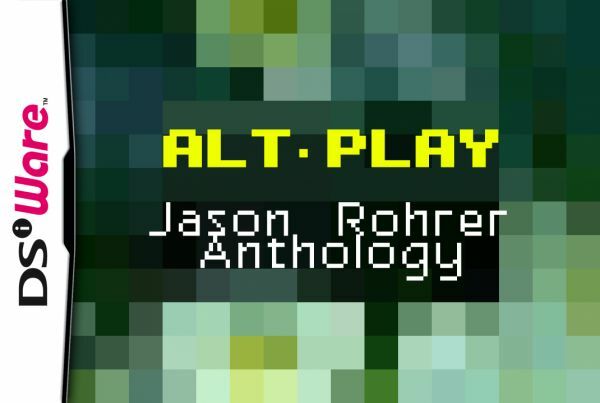 Jason Rohrer has made a name for himself in the art game sphere with numerous small and thought-provoking PC games. 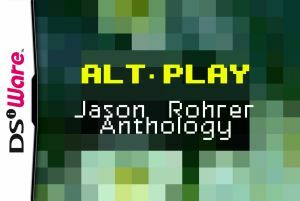 To kick off their Alt-Play compilation series, Sabarasa has pulled together a collection of three of his most notable releases so far in the Jason Rohrer Anthology: Passage, Gravitation and Between. 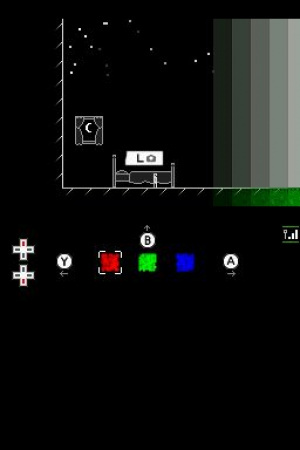 While DSiWare patrons have come across the man’s work before by way of puzzler Primrose, the three titles bundled here are significantly less “game-y” in premise. Passage is the most straightforward of the bunch, where you take control of an avatar and navigate an elongated maze for your five-minute life until you suddenly and without warning drop dead. It doesn’t sound like much, but the narrow playing field (seemingly no more than a dozen pixels high), shifting perspective and other limitations all come together for a memorable experience. Gravitation is a bit more subtle and at the same time contains more of what you might call gameplay, but as expected the gameplay itself isn’t the primary draw. Your avatar, in this case Rohrer himself, begins at the bottom of a large vertical platforming structure, with a playful child on the one side and a furnace on the other. 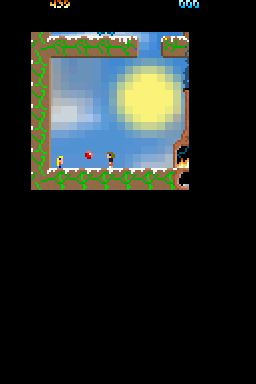 Your field of view reflects a mood of sorts and varies in size, and as it grows and shrinks your jumps are more powerful or limp, respectively, and the surrounding world turns either warm or cold. When your mood is at its peak, your head will burst into flames. 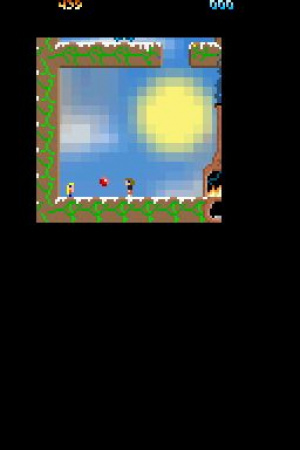 Playing with the child (named Mez, who is Rohrer’s son) will increase your mood and thus your jump and view space, which helps you jump out of the bottom room and into the platforming area. Littered among the platforms are stars, which must first be reached in order to send them below to the bottom level and then pushed into the furnace to achieve any sort of score. It becomes an exercise in prioritization and, seemingly, its effects on balancing creativity and work with family. 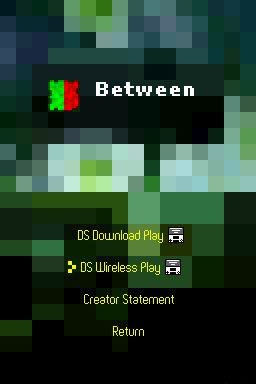 Between is a multiplayer-only game for two where you construct colored towers. It’s not a direct cooperative game, though, in the sense that it’s not crystal clear from the outset that you and the other player are even working together, or that there even is a second player. But slowly you see the effects and changes they have on your end, and it’s a pretty unique feeling to realize that someone is out there. While the impact for each game plays out largely the same on a DS, Between unfortunately suffers a bit in the transition from computer to ad hoc multiplayer. Part of the magic comes from not communicating with each other, or even knowing whether or not someone else is on the other end, but when forced to play in the same room the illusion breaks a bit. Of course, you could argue that knowing that someone else is out there in the first place may cause a loss of luster, but playing with a stranger online with no communication is different than rounding up a buddy with a DS in the same room. These aren’t games you play competitively, to rack up high scores or even necessarily more than twice. What they are, though, are unique, sometimes fascinating experiments that push the medium to places it typically doesn’t go. And the above, mechanical descriptions don’t really do the games justice for what they strive to do because what that is needs to be experienced for yourself in order to get the most out of them. This anthology does a nice job of tying the works together in a pleasing way and providing supplemental information for each game, including notes from Rohrer to provide a little more insight into what they strive to do. These notes weren’t written specifically for this anthology, though, and are the same as can be found on his Web site along with the games in question, all free of charge and available for Windows, Macs and Linux machines. A bit more behind-the-scenes stuff would have been nice for this little compilation, but it delivers enough little extras for its price. Nothing here really benefits terribly from being playable on the go, and when the games themselves are available for free for hardware you most likely already have, paying an admittedly modest 200 Nintendo Points for this anthology seems like a curious proposal. However, the experiences are undoubtedly unique and worth paying a small amount for, if only to support the continued creation of medium-exploring software, as there is nothing else like it on the handheld. Only 200 points? I might consider this one... Great review! Meh, Won't be getting. Especially after reading Chicken's first impressions. Bear in mind I only played Between. The other two games may well be ones that I'd react more favorably to. I've played all three, Between was the worst of them by far imho. Great review, Jon. Great to see this reviewer gets the concept behind these games. I was afraid we'd see a 2/10 review complaining about the gameplay, graphics and lack of high score saving. this anthology features straight-up works of art. if you download them with that firmly in mind, they're worth the glowing praise, and there's nothing wrong with selling art as DSiWare -- Electroplankton was the same way, really. However, if you think you're getting anything with any kind of point other than maybe how Mr. Rohrer wants you to feel at a given point in time, you're going to be gravely disappointed. i know i was... i'm kinda wishing i hadn't bothered to pay for it since they're online already, to be honest. all this is gonna do is take up space on my SD card, and that 200 points could've gone toward something i'll want to play over and over again. the least this Anthology could've done was track high scores to give me some reason to come back to it after having experienced what it has to offer. also, someone on the forums (i think it was Oddy) brought up that Between requires use of the shoulder buttons, so if yours are shot, you're gonna be out of luck for 1/3 of what's here. Nice review, but I'll pass. Doesn't seem like my cup of tea, but it might be for someone else. I've only played 'passage' on the PC. It isn't so much a game as a comment on life, full of subtle little metaphors about the journey through it. If I owned a DSi I'd buy this for the measly asking price just to thank Jason for making a game that brought about genuine emotional content. Jason Rohrer's best game by miles is Sleep Is Death. Just wanted to plug that amazing game for a second. I just got my mom to play "Passage." Eager to hear what she thinks. @Odnetnin: Report back, please! I'm curious as well. I agree with what TBD said wholeheartedly. I also wish that you could save your high scores for an incentive to play it more than a few times, but I suppose the creator wanted to reflect the conditions in life: When you die, it doesn't matter what "score" you got, and you (probably) can't take that score with you after you die. As I was expecting a game, I was deeply disappointed at how much it WASN'T like a traditional game, and wished I had saved my money for a game that I could actually find a "point" for playing. But, it should be considered a work of art, I suppose, and in that respect, it succeeds. Okay, so she walking down the stairs because we were about to eat dinner and watch a movie when I called out, "What'd you think?" At first I was slightly irked that it seemed she hadn't been completely involved in just the "game" (not calling it high art per se, but certainly not a game) for the full five minutes, and was worried she hadn't gotten any meaning out of it. "That was interesting," was her initial response. I had to wait for a commercial to ask her more, at which point she first commented on how surprising it was to see the spouse die. She said that even when that happened she still didn't expect her character to die as well. I took the next commercial break to explain the concept of treasures in the piece and the costs and benefits of marriage, score-wise, and she understood how every seemingly arbitrary choice in "Passage" was loaded with meaning. Frankly, I think she was just surprised and impressed that a slice of interactive entertainment (notice how I avoid the term "video game"), let alone a 16x16 pixel, $2.00, one-man production could actually communicate emotion. And although I have immense respect for the fun and happiness games can bring, I have to say: so was I.
have to agree about Sleep Is Death. truly unique game, even if requires some effort on controller's side. Ooooh, this one seems interesting! I will definitely be downloading. Since it was 200 points I bought it the day after it released and, as sorta games, they were interesting. Playing them without any knowledge about their background and what Rohrer wanted to convey with each game made them even better. Congrats to Sabarasa on this new release and I hope that enough copies are sold so they can pursue more releases for indie games. @KrazyKain I play them every day or so, actually. I just played them on my computer and I don't like them much. I'm glad I didn't pay for them. These truly are works of art. I feel like my whole outlook on games has been completely changed within a mere matter of minutes...wow. Just wow. Granted, these games aren't everyone's cup of tea, but if it works for you and you want more, there's a whole art-games movement and lots more around (though I think Jason Rohrer is among the better known designers). Many of the games are free for download or playable online. PlayThisThing.com -- a game review site that covers game design and out of the mainstream games, including art games (search for "art" and you'll mostly get what you're looking for). @Odnetnin Yeah, I've been playing them a lot as well.... I'm not sure why, but I don't seem to tire of them... They're really gorgeous.... It was sad to see the child disappear in Gravitation, and Passage really made me reflect on my life..... And how disappointed I am of it...... Hehehe..... Well, I for one love thinking and video games, so it's nice to see a game that is a work of art. I thought Between was rather fun...... My sister and I mucked around with it for hours. Does anyone know how to get all the blocks because if you do that would be a great help. We are eager to complete at least one tower. Hahaha.... We've figured out how to get some of the blocks, but the block in the middle that has blue on the inside and red on the outside? Yeah, we don't get that. Anyway, back to the game itself, it's amazing, perhaps after a while a little repetitive, but certainly not a waste of time or points.......... Just beauty. And in what most people wouldn't expect, too. A video game. Oh, get a grip, people!!! LOL. Just kidding. Kind of. I didn't love it as much as others (I'm an artist so I do appreciate art!) but I definitely don't hate it. I think it could use some brushing up and some audio help here and there, but for 200 points I guess you can't ask for much more than this. I love that its a different kind of "game", much like 100 Classic Books for the DS, it changes the way we use our DS, and for that, I love it. More of this, please. Just with a little more... oomph! I give this 6/10. I'm not afraid to admit that the first time I played Passage it made me cry. when i finally realized what Passage was about, it made me want to shead a tear of joy and sorrow, but i could'nt.